This is a very beautiful example of the popular blush pink and ivory color scheme that a lot of our brides seem drawn to. It is soft and lush and has just a hint of color. 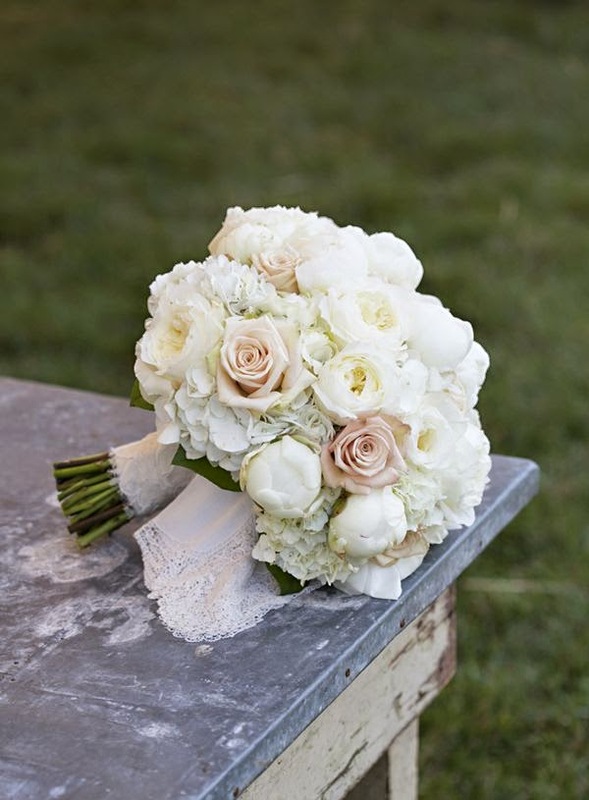 The blooms you see are white peonies, blush pink astilbe, and white anemones with black centers. 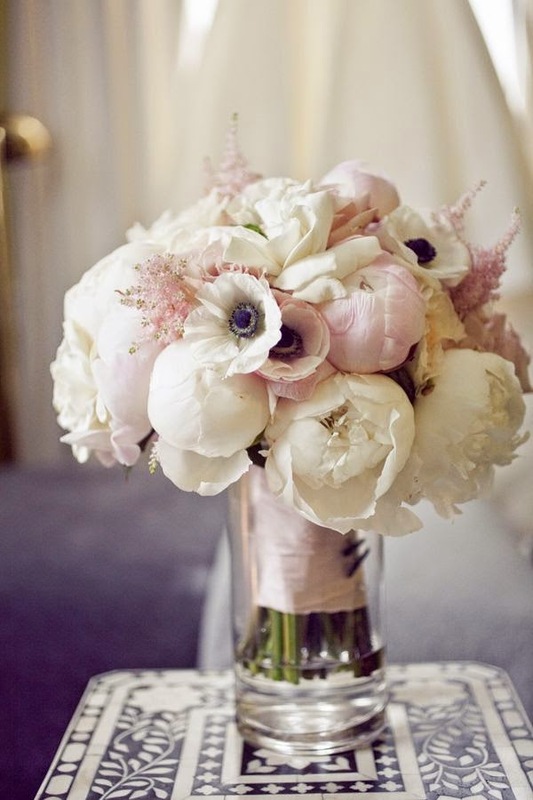 These flowers work well together in this arrangement and are romantic and distinctive. The first two photos are of the same bouquet. 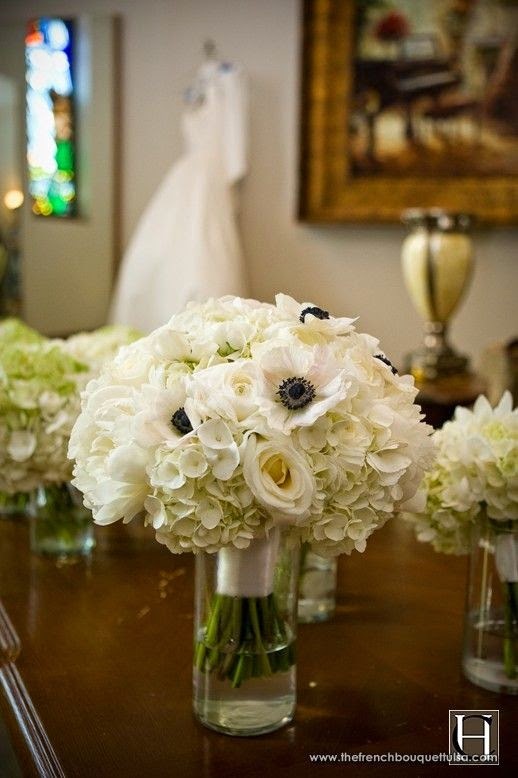 In this design, peonies and anemones are still used, but the bouquet is backed with white hydrangeas to lessen the number of peonies needed. It is still a very lush bouquet and the blush pink could be added with a filler flower or by changing the shade of the roses pictured. 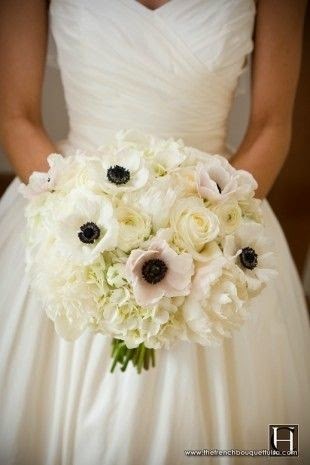 The third image is a very similar bouquet but without anemones. If they are not a deal-breaker for you, removing those blooms and adding hydrangea in the background can be a significant cost savings. We just did a consultation with a bride that brought us the Pinterest picture with all the high-end elements. Since she had a budget range that wouldn’t quite cover the inspiration picture, we made similar suggestions to save her almost 30% on her bouquet. Although flower prices fluctuate in different markets and different seasons, just a few substitutions for our bride meant that she could still have the look and feel that she wanted without breaking her bank. In a lot of cases, the price of an arrangement really boils down to the flower details- bloom varieties, demand within a season, and the quantity needed to achieve a look. Flexibility is key when working within a budget AND a great inspiration picture.